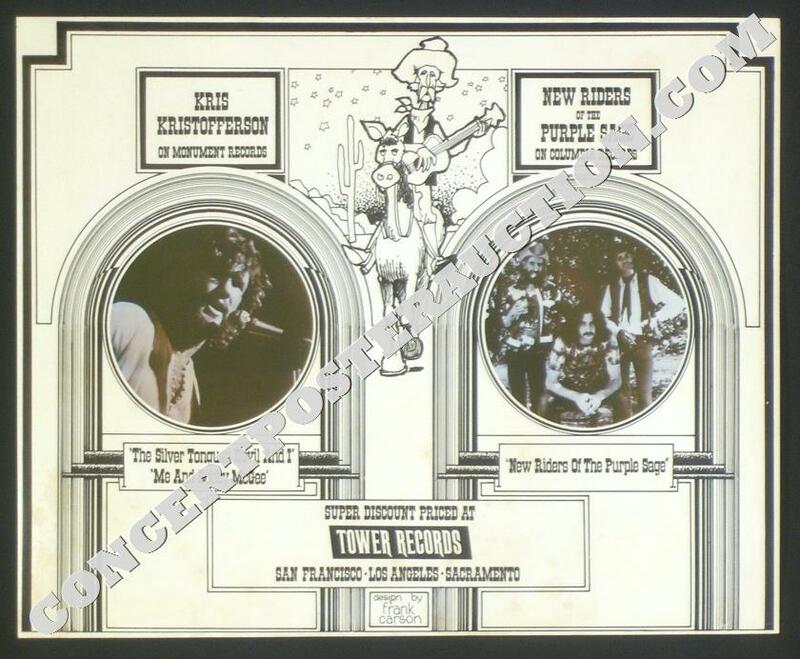 Original 1st/only printing 17&1/2 x 14&1/4" Tower Records 1970/71 promotional poster promoting the then-current releases by Grateful Dead offshoot New Riders of the Purple Sage and folk/country legend Kris Kristofferson. Art by Frank Carson of Carson Morris Studios, this was one of a series of promotional posters done for the now-defunct Sacramento-based music retailer. Others from the series include Ten Years After, the Grateful Dead, Jefferson Airplane, Moody Blues and more. Medium glossy stock poster is in good to very good (B to B/B+) condition; a few scattered subtle surface stains/age spots, light handling and a few minor edge creases, otherwise fine. Very uncommon and cool early NRPS/Kristofferson promo. Interestingly enough. the "New Riders" (as pictured) include Jerry Garcia's longtime guitar tech Steve Parish, along with Spencer Dryden and John "Marmaduke" Dawson.